Pick up a bag of shredded cabbage for effortless preparation of this vibrant salad with a mixture of sweet and savory ingredients in a sweet balsamic vinaigrette. 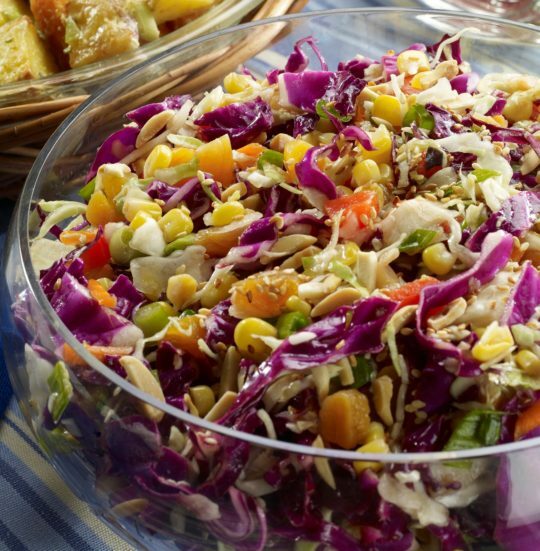 Whenever I make coleslaw, it is always for a crowd, and this recipe feeds them all. Find more recipes from Holly Clegg's trim&TERRIFIC Gulf Coast Favorites cookbook. In large bowl, combine green and red cabbage, red pepper, apricots, corn, green onions, almonds, and sesame seeds. In small bowl, whisk together remaining ingredients. Toss dressing with salad, mixing well.